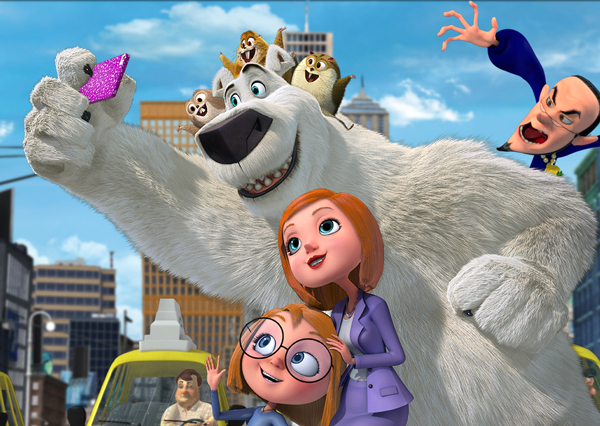 Most animated for kids movies involving the frozen north or south involve penguins, whales and climate change. Norm of the North deals with a talking polar bear and his lemming sidekicks against wanton real estate development. The debut directorial effort of Trevor Wall was written by Steven M. Altiere, Daniel R. Altiere, and Malcom T. Goldman. The film is filled with caricatures and somewhat amusing slapstick humor, not to mention an annoying twerking dance called the Artic Shake. The movie was originally supposed to be a direct to video feature. Two more follow ups are due to your Red Boxes soon. Polar bear Norm (voiced by Rob Schneider) is basically a failure as a predatory hunter. His attempts at chasing seals are never successful, that even with tourists egging him on to kill so they can film it, he just can't do it. The rest of the local arctic critters all tease him of his inability to hunt. Norm had sought advise from his grandfather (Colin Meaney) who told him that Norm was given the gift like him to talk human. The reason for this gift is something that he has to discover on his own. He tells Norm that he is a bear with too much care and not enough scare. But now his grandfather has disappeared. Socrates (Bill Nighy), the psychiatric seagull tells him that he may have gone to stave off some impending doom. The clue to that possible doom shows up on the ice as a “model home". A land developer of Greene Homes (Ken Jeong) wants to offer condos in the arctic. He sent up his marketing manager Vera (Heather Graham) to find ways of selling the concept. Norm and some of the lemmings (looking and sounding somewhat like Minions), sabotage the commercial shoot. Except that Vera manages to catch some footage of Norm looking mean and charging the camera. Greene loves it and puts out a call for actors to play a polar bear as their mascot. Norm and 3 of the lemmings follow Vera back to NYC where they hope to stop the development. He gets confused for one of the actors hoping to represent Greene Homes because after all he speaks human. He gets the job because he looks, smells and sounds like a polar bear. He becomes friends with Vera and her genius daughter hoping for her help in stopping the project. At the Greene's office he smells his grandfather who is being held captive in a hidden room. Together they plot to save their world. It's pretty predictable even for kids to figure out. Greene is so over the top representative of corporate greed. The cute little lemmings for some reason urinate in planters and fish tanks. And nobody realizes that Norm is actually a polar bear. It's one of those watch and forget kind of kids films.